Answering a Far Out Objection: 5 Reasons Why Jesus Wasn't Resurrected by Aliens - Is Jesus Alive? There are a few things that are tacit in this cheeky kind of reply. For starters, maybe they don’t know how to refute the historical evidence because it’s really just that good. This would definitely be a point on the Christian’s side. Or, they think that theistic belief is a lot like believing an advanced alien race killed all the dinosaurs or are responsible for the ancient pyramids. Well, that’s not a very friendly move to make. How do we respond to this objection? For starters, what exactly makes belief in God so absurd? For someone raising this objection: Are you at all familiar with the cosmological argument, teleological arguments (fine-tuning, origin of life, etc.) or the moral argument? Are we really to believe that these arguments are on equal footing with the off-the-wall arguments found on Ancient Aliens? Is it fair to say that stories of miracles and spiritual experiences are no more believable than stories of alien abductions? Statements like these go to expose the prejudice that some (but certainly not all) atheists can have against believers. But we can brush that aside. Let’s take the bait for a second and have some fun. Here are some reasons to think that aliens wouldn’t be responsible for the resurrection. We’ll call on some “expert witnesses” here against this theory. 1. The evidence for intelligent alien life is low. There will be no civilization if a star is too large or too small, if a planet’s orbit or obliquity is wrong, if its size or chemical composition is unsuited, if its surface is ill-equipped, if its geologic and meteoritic history is too inauspicious, if the powerful chemistry needed to generate the first life forms is too intricate or too slow …If we are to have company in our volume of the galaxy, the likelihood on average for each of these conditions has to be pretty high—better than 20 percent. If the probability of some, such as the chances for life to form, evolve or survive, is much smaller, then even if the others are 100 percent certain, it is unlikely there are any stars near us hosting intelligent beings…Despite the growing catalog of extrasolar planets, the data so far does not alter estimates that we are effectively on our own. All of the factors of fine-tuning for life to arise here on earth is itself an argument for design. It’s clear that chance alone wouldn’t do the job. Some scientists say that the chance of a planet like ours arising is 1-in-700-quintillion. And the earth isn’t physically necessary. So it’s reasonable to think it was designed. So the irony here is that the evidence that we’re probably alone is also evidence for God. Plus, the chances of life coming into existence from non-life are also virtually nil. Scientists put around 1 in 1040. Some argue it’s less than that. For abiogenesis to happen again (I don’t think it ever happened, but that’s a different blog post) would be pretty miraculous. We’re compounding improbability upon improbability now. 2. But hey, for the sake of argument, let’s grant aliens exist. Since they’d live such a great distance away from us, would they even know that we exist? If we are optimistic, and we assume an advanced extraterrestrial species has the technological capabilities to detect humanity’s very first radio waves (and distinguish them from the general background noise of the universe), we can estimate our farthest signals are a little more than 100 light-years away. If you threw a dart at the map of the Milky Way, and wherever that dart landed is where an advanced alien species resides, there would be a cosmically small probability that they live close enough to be aware of our existence. Even if you threw 100 darts, it’s a near certainty that none would land in the little blue bubble of our radio waves. 3. Granting the existence of aliens, would they have visited us? The point is that the distances between objects in space are incredibly vast, even in our solar system — let alone between stars in our galaxy or in other galaxies. Yes, I know technology is an ever-improving thing for any given civilization, and that someday we may be able to travel far faster than we now believe. Yet physics is physics, regardless of how technology changes. Light can travel at the fastest known speed because it has no mass; anything with mass takes an incredible amount of energy to start moving at any impressive speed. With an ion propulsion engine, the best technologically feasible idea we now have, we could travel to the nearest star in something like 75,000 years. But that’s only if the world’s politicians had an unlimited budget to offer up for such a project. And there are serious logistical problems too. How do you stock a spacecraft with enough munchies for a 75,000-year trip? When it really comes down to understanding the physics of space travel and the vast distances between stars, it’s pretty discouraging for the idea of flitting about throughout the galaxy. Sorry captain, no warp speed for you! It’s just not feasible to imagine how such a trip would even remotely be possible for any race of physical beings, no matter how sophisticated they might be. 4. What benefit would aliens get out of raising someone who believed he was the Jewish Messiah? I’ve even seen skeptics say that it would be difficult to imagine an alien spending their precious resources traveling for thousands of years just to pull off some sort sick joke on us silly humans. 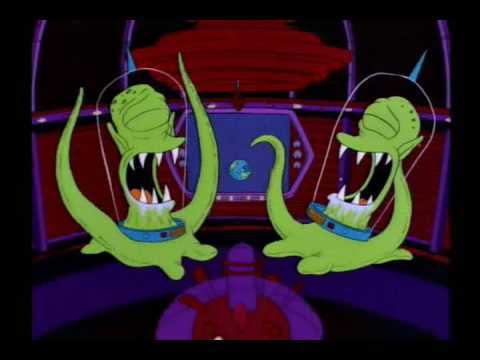 Did these advanced aliens enjoy a good laugh at the Cantina on Mos Eisley over it later? On the flipside, if God wanted to reveal himself to us, the resurrection would be a really good way to do it. In his classic work A View of the Evidences for Christianity, William Paley asks rhetorically “In what way can a revelation be made but by miracles?” Paley’s answer is straightforward: “In none which we are able to conceive.” In other words, if there is a God who wants unmistakably show Himself to us, miracles are not improbable, they are unavoidable. 5. According to the Gospels, Jesus claimed that the one who raised him was the God of the Bible. There’s good evidence God exists. It’s not comparable to whacked out ancient alien conspiracy theories. That there was an origin of life on our earth, and that our life-supporting earth is as rare as it serves as evidence for God. And it serves as evidence that aliens probably don’t exist. But even if there are aliens, they probably don’t know about us and haven’t come here, especially to authenticate the message of Jesus. God, on the other hand, would want to authenticate his message. But hey, if that’s the best skeptics can come up with to explain the evidence when pressed, then I’d say the evidence for the resurrection is pretty good. But this isn’t a move most would make. I’ve even had skeptics say raising this question is just a bad idea. 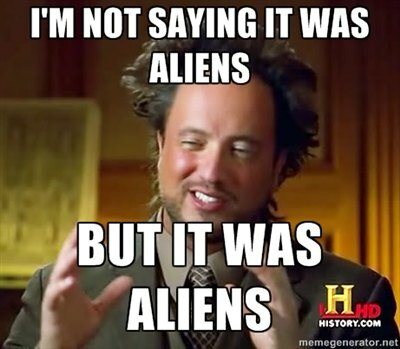 In a forum one said: “you can think of about this universe that we know, any theory we’ve come up with, at no point did we say “well did you disprove aliens first?”. That’s nonsense.” Amen to that.